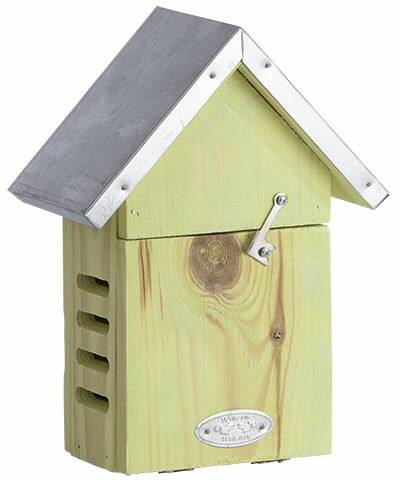 Invite beloved ladybugs to live in your backyard with the Esschert Design Ladybug House. These insects are a welcome visitor to most gardens, as they offer natural pest control with their diet of caterpillars and aphids. This charming home offers ladybugs a convenient resting spot, and can be left outdoors during the winter for their protection during hibernation. The pitched metal roof and rectangular body create a traditional silhouette, while four oblong entries on two sides of the home allow the insects to access its interior. A latch on the front of the home keeps it closed, and this panel can open in moments for you to add nesting material or larvae to the chamber. Use the keyhole opening on the back of this shelter to place it on a post or wall in moments, or rest its flat base on a level area in your landscaping. The wooden body is perfect for many seasons of service, and its light green color enhances your flowers. Enjoy ladybugs in your backyard with this Ladybug House.